Designers preparing for the first runway show of this year's Fashion Focus had to contend with pouring rain that dripped onto the runway and even flooded the backstage area. But although we were warned about wet models and dresses, the show went on with little evidence of the disaster. The roster included spring 2010 collections from more established local designers who are sold at Macy's as well as the six designers-in-residence of the Chicago Fashion Incubator. For the most part the offerings were practical, well-executed, and wearable. If there weren't many examples of the kind of giddy inventiveness or technical wizardry that make the art of fashion so enjoyable, well, that's generally not what customers head to Macy's for. Here are a few of the highlights. Lara Miller addressed the reascendance of the take-no-prisoners shoulder with a blue knit dress that softened the bold look (a little) with ruffled sleeves, but other pieces stuck to a more familiar silhouette, occasionally augmented with cool fabric necklaces made out of knit bamboo or vintage rayon tape. Blake Standard offered a red pique jacket that resembled a stripped-down version of a men's frock coat rendered in soft fabric. Shrunken versions in purple and ivory knit with button details followed. Hard-to-type label 5p1t (the name refers to five-pocket jeans and a T-shirt) showed a terrifically romantic silk shantung dress in a pretty green print. I loved a green silk peplum jacket combined with a ruffly top and a sleek high-waisted khaki skirt (pictured at the top of this post). It was good to see actual plus-size models wearing Tennille White's designs, especially a gorgeous fluttery silk dress in a peach and cream print. I liked the train on a gray-and-silver tweed ensemble by Jermikko. 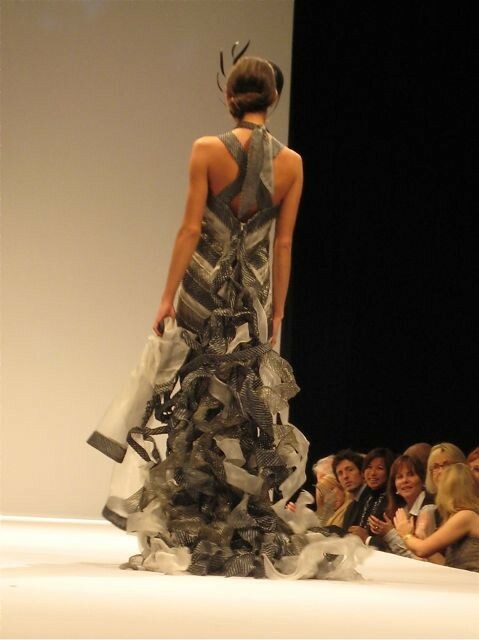 Out of the six designers-in-residence, Cynthia Ryba showed the most impressive work. Her minimalist shapes, intriguing touches like diamond-shaped panels in a silk skirt, luxe fabrics, and mix of prints reminded me of Calvin Klein and Prada. A blue jacket over a chocolate mustard print dress looked inviting and current. Jess Audey of Audey illustrated her continuing love affair with the 50s with printed dresses paired with flirty bright petticoats, saturated reds and blues, and vintage-postcard styling.